It's not every day that you get to meet a living legend in the fashion industry. 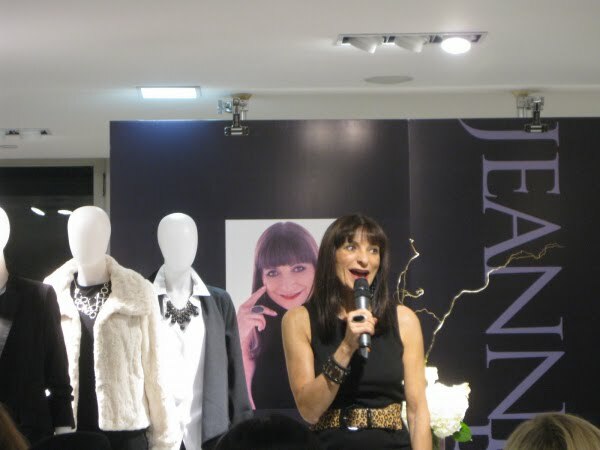 When I received an invitation to a party promoting Jeanne Beker's new clothing line EDIT--with an appearance from the Fashion Television host herself--I headed to the Bay's downtown flagship location along with fellow fashion industry insiders, media personnel, Jeanne Beker fans, and the Bay's clientele. EDIT is a collection of well-priced versatile basics intended to transcend seasonal changes and stay in a stylish busy woman's wardrobe for several years. As she conceded during the Q&A portion of her appearance, Beker is not a designer--she has "too much respect" for what designers do to call herself that--but she is an editor with a discerning eye, and with her new fashion endeavour she is presenting an edited-down collection of standby pieces: the perfect blazer, a little black dress that goes from the office to cocktail hour, a fitted white shirt. I know this doesn't sound terribly exciting for diehard fashion fans who crave trendier offerings and already have all the basics they want. But good basics executed well are always hard to find, and if Beker's line helps the general populace dress better and makes their shopping experience less frustrating, then more power to her. After fielding questions with articulateness and candour, Beker remained to sign autographs and meet fans. The lineup was long but definitely worth it. I had a chance to catch up with friend and gorgeous blogger Carolina of Closet Full of Nothing, who was also wearing her Chanel 2.55. We had to get a photo of our "bag twins" moment. Lest you think this is mere coincidence, Carolina and I established long ago that we were bag twins and we planned the whole thing. I'm still waiting for the day when we wear our matching bags, Talula oxford shirts, and Urban Outfitters straw fedoras. How about it, Carolina? 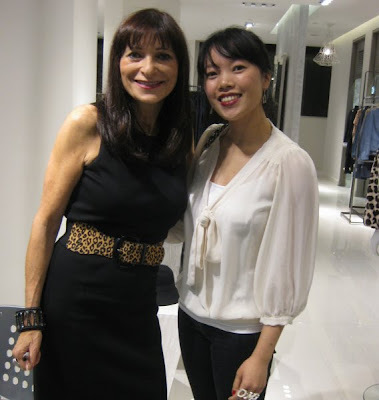 Meeting Jeanne Beker! She was absolutely lovely and complimented my Pretty Pennie sterling silver wishbone earrings. My blouse is from Zara (as seen in this haul video). Speaking of silver jewelry, I also wore my Wendy Brandes OMG rings out that night. The boy snapped the photo below for me. Did you know the rings are extremely handy for situations that render you speechless? Encounters with notable fashion personalities and encounters with delicious steaming bowls of spicy ramen from Benkei both merit an OMG. Lovely! You are so lucky to get invited to all these cool fashion stuff! Yummy ramen! They are so good in the cold weather! That blouse is so lovely. Miss Le Mode Du Jour has the same one, but in grey. OMG ramen! I love Benkei. OH My! You are so teeny tiny and look fantastic! My Mom was at the event and blogged it too lol I just posted some pics of her..she's been going to so many events. I'll have to hook you guys up one of these days! Great post lovely Lisa! This sounds like such a great event! I love the idea behind her line. I've noticed that there are so many girls out there who struggle to find simple staple items for their closets. Love that Zara blouse (I was going to get that in black) and of course the fab rings! You're too cute Lisa! Such a great post - and lucky for you to meet Jeanne! I love the OMG rings - Wendy Brandes is great :) Have a good week! It's almost unreasonable how gorgeous you look! You look FABULOUS with red lipstick! Bahahaha! I love that last picture of you! Too funny! Oh the Chanel envy. It's constant. HA! Looks like such a cool event! LOL about the ring! it does work in many many situations, and looks like a fun party! Love this post, Lisa! Cath and I live vicariously through your Vancouver fashion outings. ohhh how lucky, you met her! can't wait for more goods from thebay! that's my favorite picture of you! Such a fun post! I'm super jealous over here over you and Carolina's jumbos. Think I might need to find me one too! I'm very impressed you managed to eat a bowl of spicy ramen while wearing a white top. I always splatter! Haha I actually did splatter but managed to get the stain out when I got home. Thank goodness for Tide pens.